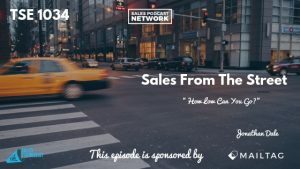 TSE 1034: Sales From The Street - "How Low Can You Go?" Jonathan Dale works with RS&I, a nationwide company with nine branches throughout the United States. They have become the largest distributor and sales agent of dish networks. Anyone wanting the ability to resell dish networks must go through RS&I to do so. They also own HughesNet, one of the largest satellite internet providers. Jonathan manages the Vivint portfolio. 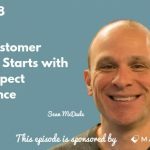 As a sales leader, he teaches sales reps how to keep the sales process simple by breaking it down. Jonathan has had so many different experiences with both sellers and partners. It brings a whole other level of complexity to his role as a sales leader. He remembers knocking on doors to sell home security systems for a company called Pinnacle. It is where he learned the ‘Art of the Sale.’ Although he didn’t particularly love it, he admits that he did learn from it. The following year, after several failures, he fully understood the sales process and realized he was a salesperson. It required taking a step back and looking at sales in a whole new way. 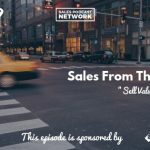 Jonathan believes that salespeople commonly place a stigma on sales, or have a mindset about it, that prevents them from being successful. It is a mindset that they have to sell based on price. Jonathan’s biggest struggle when training new reps in the home security industry is teaching them to become more of a value salesperson versus a commodity sales rep. He wants them to pitch the overall value of the service rather than diluting the service. Let the customer decide what the spending habits will be. The opportunity for a sales rep to make the most money is when the customer is comfortable with where he wants to be. Often times, as sales reps, we want to fit each customer into the same size box. Yet, at the end of the day, if we try to force that fit, we lose money. Forcing our clients into a package that they do not need only leads to chargebacks. Jonathan works with over 350 different retailers that take Vivint as a secondary, tertiary, and even fourth line sale. It is a struggle to get them to understand that he doesn’t want them to compete on price. Instead, he wants them to have a conversation about the value of the service and let the customer decide if the product fits their needs. Sales reps, however, are prone to touting the price because it seems easier. Jonathan made an interesting transition two years ago which was actually detrimental for a few months. He moved from home security sales – a totally valuable sale – to satellite sales which was more of a commodity. He realized he was losing money because he wasn’t committed to the value of the product. Often times, sales reps want to take the path of least resistance – the easier sale. If you can provide the customer with benefits, instead of simply selling features, you create value in your product. By allowing the customer to then determine his spending habits, your earning potential is maximized. When I sold training classes for $10K a class, the most money I had ever had in the bank at one time was $3,000. It made no sense to me. I just couldn’t understand why someone would spend that much money. As a result, it definitely limited my ability to sell. I needed to realize that my clients would get a huge return on that $10K investment – that there was a value to what I offered. We don’t know their spending habits or capabilities. Instead, believe that your product is the best in the industry regardless of what the competitors offer. Know that your prospects will pay for it because it is the best product available. Keep it simple, silly! K.I.S.S is an acronym that Jonathan keeps in mind when he teaches the retail process to his sales reps.
Look at the product in total. Do not ‘product spew,’ meaning, do not lecture your prospects on every single detail of the product because that is not what they need. Instead, sell the benefit of the product. Increase the value of the product by explaining the ways it can serve the customer. When the question of price arises, turn it back around and ask the customer what he feels it is worth. If all went well – if the sales rep has created significant value in his presentation – the customer will be pleasantly surprised when presented with the cost because he has placed an even higher value on it. Commodity selling means to provide the customer with the necessary scenarios to imagine for himself the benefit of your service. Everyone wants to know what’s in it for them. They want to know the biggest return they can get on any investment. As sales reps, keep that in mind. The sales pitch has to continually revolve around it. When the customer can see the value – when he understands what is in it for him – he will buy. At a recent door-to-door conference, Jonathan was looking for a new accountant when he approached an accountant booth a few rows away from his own booth. They told him everything he wanted to hear. Without even knowing the cost, Jonathan was ready to sign because he immediately understood the value they offered. It was a no-brainer. In the end, the new accountant service was more expensive than the old service he had been using, but to Jonathan, the value exceeded the cost. As a sales leader, Jonathan spends a lot of time on the road. He ‘gets down in the trenches’ with his sales teams to introduce new ideas and to show them how to make changes that, despite sometimes being more difficult at first, will bring in more money in the long run. He sets the example for his team. In sales, we sometimes get into a comfortable rut regardless of results. We can’t afford, however, to continue down a road that does not deliver results. The sales industry is continually evolving and changing. New ideas and new processes are constantly created. You have to study and keep up with the times. Have fun as well. The sales process can be a fun way to learn about how people think. Figure out how people think and use it to your advantage. Be forward thinking in your sales approach. The best way to reach Jonathan is via email at Jon.dale@rsiinc.com.